All I personally need when it comes to photo editing software is a fast loading program that can resize images, make small adjustments like adding blur effects to sensitive data and save the resulting image in either the jpg or png format. And that's it. I obviously do not need Photoshop for this, and even Paint.Net may seem like overkill. PixBuilder Studio which has recently been released in version 2 is a freeware alternative for Windows. The program on first glance seems to offer a similar functionality as Paint.Net. You can associate image file extensions with the program during installation, which would speed things up if you do a lot of photo editing on your computer. You find the usual assortment of tools lined up in the main interface of the program. One interesting option is the ability to move the tools panel around. You can for instance place it under the File toolbar instead of the left sidebar. There is unfortunately no option to make it a floating toolbar as Paint.Net does. Toolbars in image editors seem to use more or less the same standard when it comes to which tools are provided there. Pixbuilder Studio is not different in this regard. You find the most popular tools there. The right side displays all other panels. This includes the zoom panel, an undo panel, custom tools panel to customize the selected tool or a list of channels. Many options are only available under the main File toolbar at the top of the program window. This includes a huge list of color tools and effects. The program supports all my requirements (including blur) and then a lot more for users who want to dive deeper into image editing. The program supports only a handful of formats, which can be a issue, especially for photographers who want to edit Raw images. Support are jpeg, gif, png, psd and a handful of lesser used formats. I suggest you take a look at the developer website which lists the core program features and offers download links. 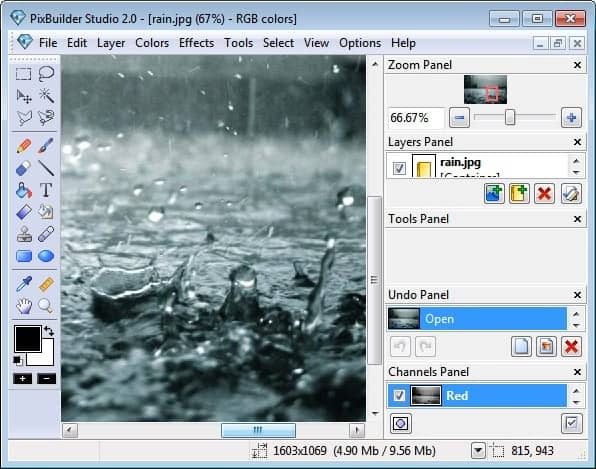 PixBuilder Studio is compatible with all recent 32-bit and 64-bit versions of the Windows operating system. The program can be a viable alternative for users who do not want to install Paint.Net because of its dependence on the Microsoft .Net Framework. Nice. I just went to the website and decided to download it. Built-in help file – something missing in so many apps these days – comes with it. I prefer the other app you reviewed, Hornil Stylepix, for light photo editing. I think PixBuilder Studio is a lot more capable than Paint.NET and has superior text handling. Paint.NET has extremely clunky layer handling. Unlike most image editors, focus is not switched to the layer selected in the layers window. Nor does Paint.NET appear to have the capability to reedit text. Great find. A less than 3 mega-byte installer impresses straight away. with minimal code without relying on external dependencies. A smashing little proggy. I shall download it straightaway lads!